SINGAPORE, Oct 11 (Reuters) – Asian shares were mixed in early Asian trading on Tuesday after oil prices surged to a one-year high and optimism over Hillary Clinton’s widening lead in the U.S. presidential election campaign pushed Wall Street higher. Brent crude rose to as high as $53.73 on Monday, the highest level since Oct. 9, 2015. It closed up 2.3 percent at $53.14. U.S. crude futures jumped 3.1 percent to $51.26 on Monday, a four-month high. They were trading 0.1 percent lower at $51.28 at 0022 GMT. The gains came after Russia said it was ready to join the Organization of Petroleum Exporting Countries in limiting crude output and Algeria called for similar commitments from other non-OPEC producers. OPEC aims for agreements to cut about 700,000 barrels per day in its first reduction in eight years. MSCI’s broadest index of Asia-Pacific shares outside Japan slipped 0.1 percent. 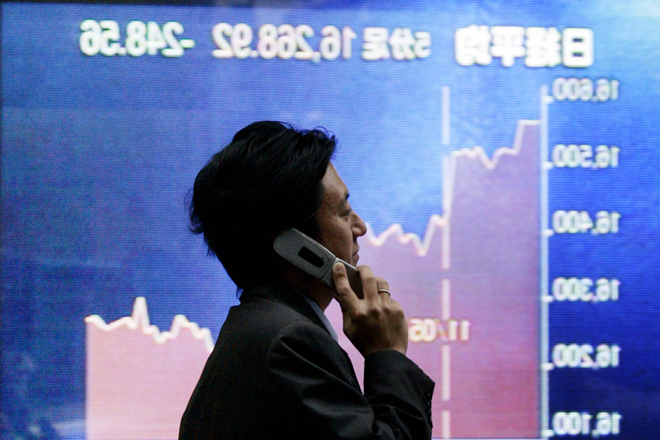 Japan’s Nikkei added 0.8 percent. South Korea’s KOSPI rose 0.1 percent after opening lower as Samsung Electronics plunged by much as 5 percent as the company struggles to contain a deepening crisis over its Galaxy Note7 phone. Samsung told customers on Tuesday to stop using their Note7 smartphones while it investigated reports of fires in the devices. The world’s top smartphone maker said it had asked all global carriers to stop sales of the Note7 and to stop providing replacements while it worked with regulators to investigate the problem. Overnight, U.S. stock indexes closed up between 0.5 percent and 0.7 percent, after the pan-European FTSEurofirst 300 index ended the day 0.9 percent higher. “The oil market news proved immensely positive for equities,” Angus Nicholson, market analyst at IG in Melbourne, wrote in a note. The dollar retained overnight gains on growing expectations that the Federal Reserve will raise interest rates this year. Traders have priced in a 70 percent chance that the Fed will hike at a Dec. 13-14 policymakers’ meeting, up from 66 percent early Friday, according to CME Group’s FedWatch tool. Investors are looking to Wednesday’s release of minutes of the latest Federal Reserve Open Market Committee meeting to see how close the Fed was to hiking rates last month. The U.S. dollar strengthened 0.3 percent to 103.95 yen in early Asian trade on Tuesday, after rising 0.7 percent on Monday. The dollar index, which tracks the greenback against a basket of six global peers, added 0.1 percent to 96.989 in early Asian trade, after climbing 0.3 percent on Monday. The Mexican peso strengthened more than 2 percent on Monday against the U.S. dollar, which fell to a one-month low of 18.795 pesos after the second presidential debate between Trump and Democratic nominee Hillary Clinton. The Mexican currency retained those gains on Tuesday. Ryan, speaker of the House of Representatives, said he would not defend Trump or campaign for him after the uproar over the New York businessman’s sexually aggressive comments that surfaced on Friday. “This is a strong signal that many of the Republican establishment believe Trump’s campaign is so toxic that they are seeking to dissociate themselves from it,” IG’s Nicholson said. Clinton has led Trump in most national opinion polls for months and Trump’s poll numbers have fallen further since Friday when a video from 2005 showing the former reality TV star bragging crudely about groping women and making unwanted sexual advances was broadcast. The euro was little changed at $1.1133.